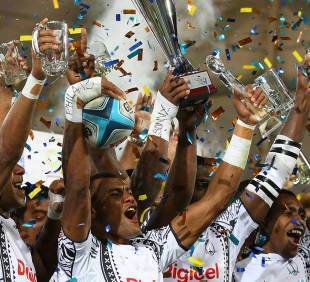 Fiji retained the Gold Coast Sevens crown after defeating HSBC Sevens World Series champions New Zealand 32-14 in a rematch of last year's final. The Fijians had a new-look side for the first leg of the 2012-13 season with just one player retained from the team that took the inaugural Gold Coast title last year. But they showed no ill effects and produced a powerful performance against the Kiwis. Fiji had defeated Samoa and South Africa to reach the final while the Kiwis had downed Argentina and Kenya to take their place. But it was all Fiji in the final. Alipate Raitini scored two first-half tries with Levania Botia grabbing another to give Fiji a 17-7 lead at the break. Raitini then secured his hat-trick early in the second-half with Joji Raqamata going over soon after to take his weekend tally to 59 points. Kylem O'Donnell crossed for a late consolation for the Kiwis but it was the Fijians who had the final say with Ilai Tinai scoring in the last play of the final. South Africa grabbed third place thanks to a dominant performance against Kenya. They beat Mike Friday's African side 41-7 finishing the tournament as top try-scorers with 28. The losing quarter-finalists France and Argentina contested for the Plate Final and it was the Pumas who came away with fifth place thanks to a 14-7 victory. Argentina had knocked out Australia in the semi-final of the Plate with France defeating Samoa. In the Bowl Final, England lost to Spain after the match went to extra-time. Spain took an early lead but Christian Lewis-Pratt struck back with a try. James Rodwell went over early in the second-half only for the Spanish to draw the game level. In extra-time, Spain's Martin Heredia grabbed the golden score against an English side who were rocked by serious injuries to both Chris Cracknell and Mathew Turner. Scotland took the Shield Final with a dominant 40-5 win over the USA. Both Michael Fedo and James Fleming grabbed hat-tricks to help Phil Greening's men to a convincing victory.